JXA-8530FPlus Field Emission Electron Probe Microanalyzer | Products | JEOL Ltd.
JEOL commercialized the world's first FE-EPMA, the JXA-8500F in 2003. This highly regarded FE-EPMA has long been used in various fields, such as: metals, materials and geology in both industry and academia. 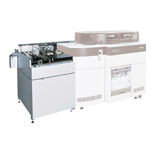 The JXA-8530FPlus is a third-generation FE-EPMA that comes with enhanced analytical and imaging capabilities. 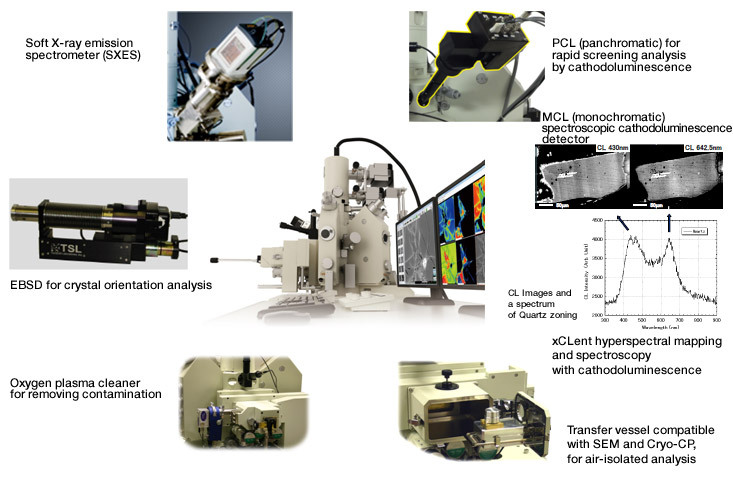 The In-Lens Schottky field emission electron gun combined with new software provides higher throughput while maintaining high stability, thus allowing a wider range of EPMA applications to be achieved with higher resolution. The In-Lens Schottky Plus FEG EPMA version, with an optimized angular current density, allows for analysis with a large probe current of 2μA or more. The resolution of secondary electron image has been improved even under analytical conditions by automatically adjusting for the correct convergence angle. Non-Flat Surface Analysis Program for automated WDS analysis of specimens with surface irregularities. This is possible due to the large Z travel of the stage (7.5 mm). Various X-ray spectrometers (WDSs) can be selected: a Rowland circle radius of 140 mm (140R) or 100 mm (100R), 2 crystal or 4 crystal configurations and a mix of standard or large size crystals. The XCE (2 xtl) X-ray Spectrometer, the FCS (4 xtl) X-ray spectrometer and the L (large 2 xtl) X-ray Spectrometer for 140R have wide spectrometry range and provide superior wavelength resolution and peak-to-background ratio. 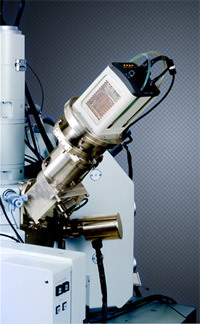 The H Type X-ray Spectrometer of 100R provides high X-ray intensity. Users can select from these spectrometers depending on requirements. The JXA-8530FPlus comes with JEOL's 30mm2 silicon-drift detector (SDD). A high count-rate SDD along with an in-situ variable aperture enables EDS analysis at WDS conditions. EDS spectra, maps and line scans can be acquired simultaneously with WDS data. 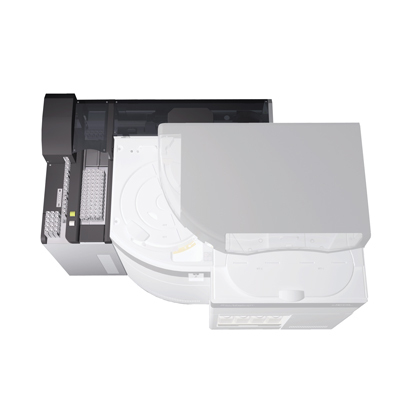 The JXA-8530FPlus is equipped with a highly-expandable specimen chamber and specimen exchange chamber, enabling you to integrate a variety of optional attachments on the chamber. High Etching Rate Ion Source, in-situ cleaner, etc. A powerful, clean vacuum system is employed on the JXA-8530FPlus, including two magnetic-levitation turbo molecular pumps. In addition, a two-stage intermediate chamber is provided for the electron optical column, thus maintaining high vacuum in the electron-gun chamber by differential pumping. The addition of optional Scroll pumps and a liquid nitrogen cold finger create the ultimate oil free vacuum system. 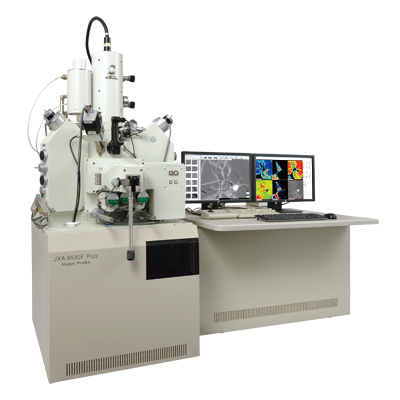 An ultra-high energy-resolution Soft X-ray Emission Spectrometer was co-developed by the Institute of Multidisciplinary Research for Advanced Materials, Tohoku University (Prof. M. Terauchi) and JEOL Ltd., etc. The variable-line-spacing (VLS) grating enables simultaneous detection (much like EDS) and allows detection of Li-K and B-K spectra with a high-sensitivity CCD. This spectrometer achieves superbly high energy-resolution, enabling detailed chemical-bonding state analysis. Regions of interest, along with X-Y stage coordinates, located in the optical microscope can be recorded and transferred to the EPMA for navigation to the desired location for imaging and analysis.